After spending few days in Anand Ashram, Bevinkoppa and visiting some Siddha Samadhis in North Karnataka, we returned back to Belgaum. 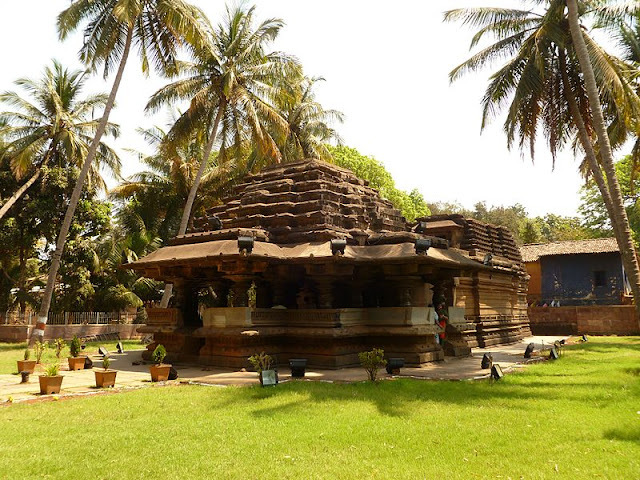 Before visiting some more prominent places in North Karnataka, we spent half a day visiting some places in Belgaum. One evening, we went to visit the Ramakrishna Mission Temple. This was the place i used to visit regularly during my days of turmoil almost three years ago. That time, never knew anything about Guru or the similar path. All i could see is finding myself sitting there in this blessed place that has so powerful vibes, especially during the sankirtans. Swami Vivekananda had stayed here for 8 days in 1892 and this cottage has been maintained very well by the ashram. 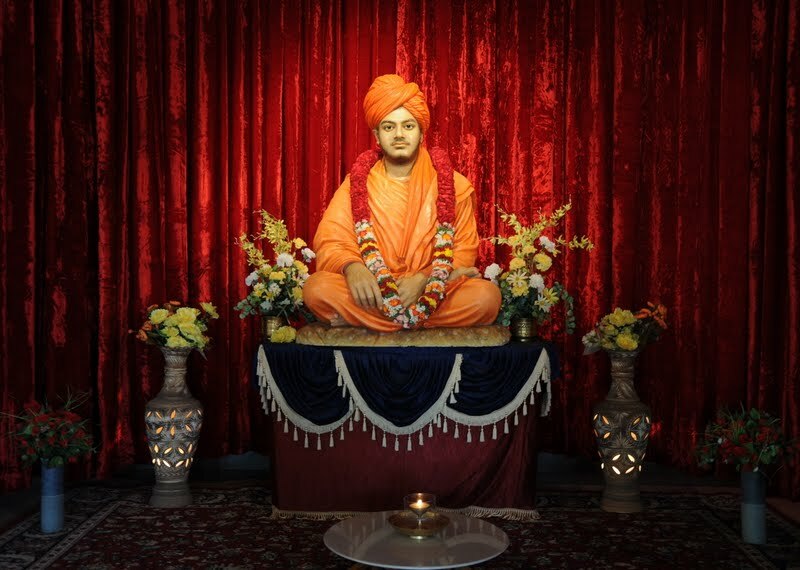 The feel of Swamiji's presence is added by the large size statue of Swamjii. There is another place a few kilometers from here where Swamiji stayed with a local person from here, where his bed, stick, padukas and other articles are still kept. Swamiji had visited Belgaum just before he left for the US. We also visited the old Kamal Basti, a Jain temple, built in 1204 in the Chalukyan style. This temple has a large idol of 22nd Jain teertankar - Bhagwan Neminath that was actually found in the Jungle 200 years back. In this temple is intricately carved a 72-petal lotus (kamal) design, the petals have twenty four Jain tirthankars carved on them. A very, very peaceful and vibrant place for effortless meditation. 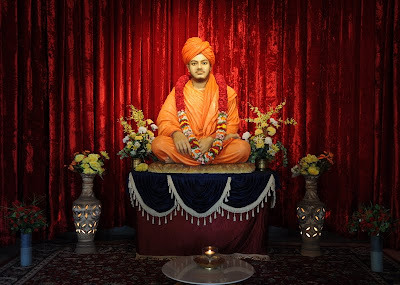 Then, after a brief visit to Sai Mandir, where the flame from Shirdi still burns and the place where i first learnt about connected to Jungli Das Maharaj, we then went to the Samadhi of Param Pujya Kalavati Aai, a very, very powerful place. A great place for meditation. People from far and wide travel here and has been the place of transformation of large number of people including entire communities giving up the bad habits of alcoholism and gambling and having a total transformation. The constant mantra jaap of "Om Namah Shivaya" resonates from every corner here even when there is silence. 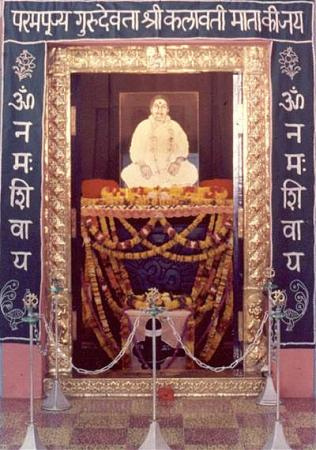 Param Pujya Aai (mother) who was a grihasti was initiated by a great Siddha Sri Siddharudha Swami. This place never promotes any kind of rituals including the burning of incense, garlands, coconuts, etc since Mother herself never gave importance to these things. Strict discipline is maintained by the sevaks here on timings and maintaining silence and movements. The place of Mother's samadhi is in the vicinity of where she lived in her house and still well maintained is this house, the drinking well and the bench where she used to sit. This has been a very regular place for me in times of much wanted rejuvenation. The next morning, we took a cab at 6 a.m. again to Anand Ashram. We had intimated Vijayanand Swami that we would like to spend the entire day to visit the places of significance up north. Swamiji was travelling back from Bangalore the previous day and was busy proof-reading of his new book to be published soon. But, Swamiji said he would send Mallikarjun with us, a very young boy who is at all times in seva of Swamiji. We had a little prasadam (breakfast) at the ashram too along with Swamiji, who quickly told me of the places that we would be visiting today and he quickly pointed out to Mallikarjun also where all he should lead us to. He quickly made a call and told that we would be having lunch at a particular place and he had informed that person to take care of it as he said there would be no proper food or hotel available in those villages. i could see that there were many places Swamiji wanted us to go, but since it was all in one day, he chose the areas that came on the same route. i told him that i would like to meet Mohan Swami also since it was in the same belt and Swamiji said that keep that at the last. Taking Swamiji's blessings, we left the place. First we moved towards the closest place from here - Saundatti, a stony hilly place, about 40 kms, a popular pilgrimage place for Shakti devotees. Above a hill is the temple - Shri Renuka Yellamma Devi Temple, which is the samadhi place of the Renuka Devi, the mother of Lord Parushurama. 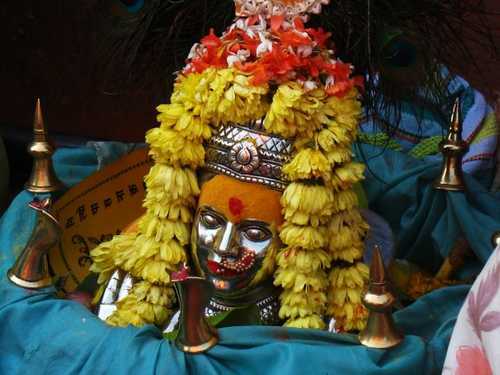 Legends say that Yellamma is the incarnation of Kali, who on one hand symbolizes the death of ego, and on the other hand is the mother who is compassionate about her children. Maa Renuka was the daughter of a king, whose guru was Saint Agastya. To read the story of Maa Renuka and her husband and her son Lord Parushurama and the happenings at this place centuries ago, click here. From here, we moved towards Hooli, a village about 10 kms ahead. This is the place Swami had asked us to spend more time and also had called up the person Shri. Basappa Annigeri, who was waiting for us eagerly, evident from the continuous calls he was making to Mallikarjun. But, on the way our attention was caught by a mutt (ashram), which when we entered realized had around three samadhi's that we could notice. It was very huge with some people still living in it. Could not get more guidance from anyone here but know that this is Siddha Hooliajja's tapobhoomi. We were quite surprised to see a Balayogi's samadhi also, but we could not gather much information about it. We moved through the house that looked like a huge mansion, having huge halls and many rooms. It looked like there were lesser people in this huge house. As we moved towards the exist, i spotted a big Nava Graha idols that showed signs of regular abhishekam. 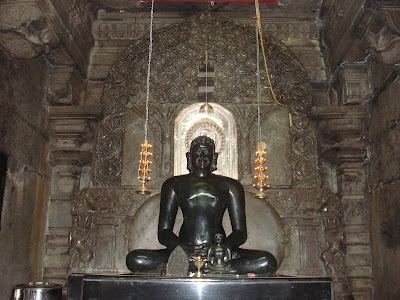 It looked that he was popularly known here as Hooli ajja (grandfather) but there has been no much information about the Siddha, even as i searched today in vain on the internet. It is hard to even know that so many Siddhas have lived here and taken Samadhis here in this belt that is nothing but groups of villages that is yet not developed in many ways with basic amenities. The land is dry here and have a hard time with rainfall. Among these rugged plains lived so many Siddhas and there are many, many historical temples, most of them linked to mythology. Even though these places do not show any signs of uniqueness in any way, if looked closely beyond the senses of perception, they carry some mysteries. People here are not very enthusiastic about the divine people that lived here, because all these years it was very common for them to have a saint among them every few kilometers. If the generations have seen so many Siddhas living in these places, it is quite clear that there would be living masters here even today. Many, as usual, prefer to keep away from public and steer clear of unwanted attention for obvious reasons. Few months back, with Guru's blessings, i had the opportunity of meeting a living Siddha aged about 120 years (read) in a very remote village of mud and stones called Kerur, Bagalkot. This time Vijayanand Swami told me that he took samadhi just a few weeks back. So, it is quite evident that there still are many Siddhas living around here in North Karnataka. As we came out, there was a huge board, which displayed many significant ancient temples and some information about it. We certainly did not have time to visit all of those including the Siddheswargavi (cave of Siddha Siddeshwar) which is on top of a distant hill. Looking at the board of places, my friend's eye caught one temple - The Panchalinga temple. On enquiry, we found it was just a few meters away and we immediately went there. This was a magnificent 10th century temple. Photographs were not allowed inside. There are 5 stone lingas in complete darkness inside these ancient stones but every Linga was placed in such a way that the light from the outside feel only on the Linga. We were told that on a particular day, the sunlight falls exactly on one of the Linga. All these walls and interior emitted a strange smell of ancient air but vibrated with peace and a sense of coolness. Walking with conscious awareness through these places itself is meditation. The person, employed there by the Government, told us that this was originally a Jain temple which was later established as the temple of Shiva. Seeing our enthusiasm took us to another room in the backyard where priests lived in those days. It was a huge hall with large pillars where many of the old idols and inscriptions were preserved carefully. He told us that this is one of the 50 temples and Lingas that were excavated since these years and there are 51 more temples and Lingas to be found, which lies buried. He says there is some mystery to these chain of temples. He added that the day the 101st temple is found, this area is predicted to be established as Dakshina Kashi. In the meantime, we were making Shri. Annigeri wait due to our unplanned visit to these areas. He was waiting outside and when we reached greeted us and ushered us into his huge ancestral house amidst the dry village of bullock carts and mud houses. Our gratitude to him for his hospitality and assistance to reach certain places. He is a devotee of Baba Nityananda. I was surprised to learn that he was among the ancestral family of Lingraj Desai, who owned so much of land that he generously donated. Today, the entire KLE society that is well established in healthcare and education began on the donated land of this family. We were offered tea and biscuits and then he then took us to the ancestral fort, now managed by the Government, informally looked after by his ancestral family, which was the place where the Lingraj family resided in those days and was the place of power and wealth. He lived here like a king and the fort was well-guarded. It contains several large rooms and verandah and plenty of open land. There is a small Shivalinga temple, and the person looking after this temple insisted that we sit there for at least a few minutes. We then moved through the corridors and it showed signs of poor maintenance but still held up photos of the royal family on the wall. We then moved towards the Shirasangi temple that Vijayanand Swami had often talked about. This temple is of Kalika Devi, a ugra form of Shakti. Photographs are not allowed inside so could not capture. i must mention that this is a very powerful place for Shakti sadhaks and one can notice around how devotees must be reaching here to fulfillment of their desires. This form of mother is well known for tantrik practices for achievement of siddhis. However, with the approach towards the mother as soumya, one can feel her love and protection in the form of fierce-yet-gentle energies. The temple of Shri Kalika Devi in Sirsangi is of mythological significance as its name is mentioned in many Hindu mythologies. One such myth mentions that a saint by the name of Vrusya Sanga was involved in penance in Vrusya Sanga Tapovan, which is currently the place where the temple of Shri Kalika Devi exists. However, demons like Narundasur (Naragunda), Bettasura (Betasur) and Nalundasur (Navalagund) disturbed his meditation. Then the Goddesses Chikkumbasura (Chikkumbi) and Hirekumbasura (Hirekumbi) killed these demons heeding the pleas of the ascetic Vrusya Sanga. The Goddesses later settled down here and hence the temple of Shri Kalika Devi was erected in Sirsangi. This temple was built during the 1st century! It was now that i recollected of the photos of Kalikadevi all around in Anand Ashram, Vijayanand Swami's room and in other places around. There is a powerful Shiva temple just next to the Shakti temple. This temple was supposed to have been established by a Siddha. Divine places these are, that are evident with the energies they hold since the hundreds of years of worship and practices. Our travel continued further to few more interesting places of more samadhis and meditating locations of Siddhas, which would covered in the next post.